Good marketing research pays off well. Now we are in the thick of it. We are still on section III of An Online Sunshine Plan - Market Research (pg 115-154, sans Articles). As covered on that first page of Section III - "Marketing" is simply finding and building markets. A "market" is anywhere people exchanges goods and services. Anywhere. Market research is NOT: "Look for a niche, find a niche product, promote that product, get the sale/get the commission." That is just one step shy of a scam. Impersonal, and non-rewarding personally. It will simply tire you out. The other reason (besides having endless content inspiration you can tap) is to work out your purpose/bliss first is so that you can stay involved and interested in what you are doing. Money has to go somewhere - your wealth has to be for a reason. (And that's not good enough to be able to "buy stuff and show it off.") There is no reason you can't enjoy every single moment of every single day and also be richly rewarded for your efforts. It's not work, it's a passion you are following. Who - is market demographics. What - is product selection. Where - is product production and delivery. How Much - is pricing. In all of these, as covered in the book, you want to look for a viable scene which matches what you are most interested in doing to provide real value to those who find you. 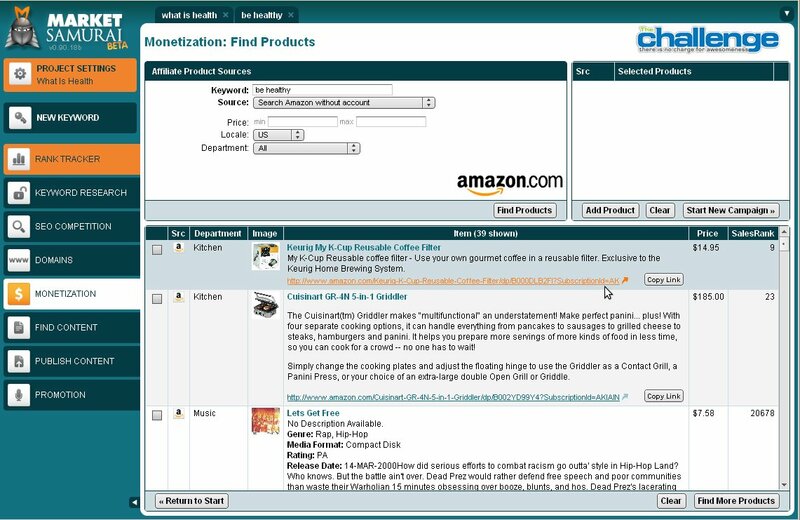 Product selection can be studied by looking up Ebay, Amazon, Clickbank, About.com, etc. (see pg 148). As we are dealing with affiliate products, you can see that they will take care of delivery and guarantees. 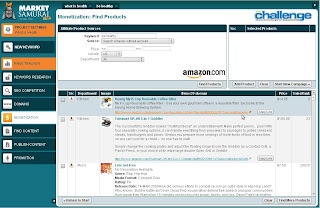 Some sites, like Clickbank, will also show a quality score - which is the rate of returns for that product. Note: Frankly, I don't recommend settling for Clickbank or Commission Junction or Amazon when you do adopt an affiliate product. Reasons - mostly in how they treat their affiliates. Clickbank has a nasty habit of taking back commissions if you don't meat their minimum every month, bit by bit. Commission Junction will simply dump your membership after 6 months with no sales. Amazon - unless you are pushing big-ticket items (not books) gives you only tiny payments. But these three tell you what type of products people are buying and what to look for (and look out for). In a later post, I'm going to give you a fuller breakdown later on what makes a good affiliate product, along with my own recommendations of a handful which have tested out over years. Right now we are looking through our Market Research to find a community which is viable and you can give value to. An article you should review is on page 177 of An Online Sunshine Plan. Charles Heflin is quoted where he gives more steps to study the community in order to best serve it. His steps: Observe, Gather, Reward, Engage, Seek - and you are already doing these in life, so his article simply enables you to apply this to your online income production. Again, I go to Market Samurai to get a lot of this homework done faster. Unfortunately, their "Samurai Dojo" doesn't go into much detail here about the tools in their product. There is one lesson, which tells you the "commerciality" of a keyword phrase. This is their "monetization" page. "Be Healthy" came up as a keyword, so searching in Amazon found a nifty little set of products you can promote. Note that if you sold the Cuisinart Griddler, you'd get a tidy sum (take about 4-8% of that price). If your passion was cooking, then this would be a nice review page to do with an affiliate payment for every sale. However, the much cheaper coffee filters are in much higher demand - and would require much more research to get that figured out. They also allow you to search from ClickBank, Commission Junction, and PayDotCom. Again: you start out with your own best interests at heart - your purpose/bliss - and find what community already exists which you can serve, find out their keywords, find out what they are like, find the products they are buying. Once you settle on that community, then you can go to the next phase - which is figuring out how to tell them what they want to hear - which is not politics (although they undoubtedly got it from marketing) - it's so you can help them improve their lives by offering and delivering true value. Here's an ebook which really builds on what we covered today: "Clickin' It Rich" by Michael Campbell. He used to sell it, then gave it away, and now it's hard to find as he's only dealing directly with a select group of clients. He'll take you quite beyond what we deal with here and starts to give you an inkling of what is needed to make extra income online. Whole picture stuff. Assignment today: catch up on your reading above. And it would be smart to go ahead and get your binders, yellowpads, and 3-hole punch to start collecting and organizing all this data for your niche. Thanks a lot for the Samurai tool. And a big thanks for the explanation of all competition being creative. It's much more exciting, and powerful, to approach a market with a creativity through the Golden Rule. Kind of like moving towards what you want rather than what you want to avoid. I appreciate the distinction you made. Thank you.